Dr. Angela Mashford-Pringle will be the Waakebiness-Bryce Institute for Indigenous Health’s Associate Director effective February 1, 2018. She will also begin an academic appointment as Assistant Professor of Social and Behavioural Health Sciences at DLSPH. “I’m delighted to continue working in partnership with Angela to lead the Institute and bring Indigenous education, research and knowledge to the forefront of the Faculty and the University,” said Dr. Suzanne Stewart, Director of the Waakebiness-Bryce Institute for Indigenous Health (WBIIH). As an active member of the U of T community, Dr. Mashford Pringle holds a PhD in Aboriginal and Public Health from DLSPH and has lectured in Indigenous Studies since 2010. 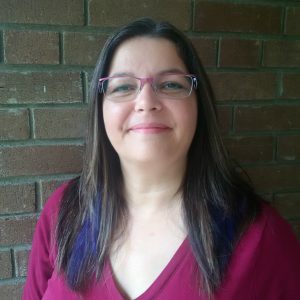 She is an urban Algonquin woman from Timiskaming First Nation in northern Quebec whose research focuses on the intersection of Indigenous health and education. Before joining the WBIIH in 2016 as a Research Associate, Dr. Mashford Pringle held research and administrative leadership roles at the Peel District School Board, St. Michael’s Hospital’s Well Living House and at the Public Health Agency of Canada where she managed the Aboriginal Head Start Urban and Northern Communities Program. She also helped launched Centennial College’s Aboriginal Business Diploma and has taught Indigenous Studies at Sheridan College. In the role of Associate Director, Professor Mashford Pringle will serve as co-editor of the International Journal for Indigenous Health, co-develop the new MPH Indigenous Health stream, direct the Collaborative Specialization in Aboriginal Health, teach two Indigenous health and social policy courses, advise and mentor students, and be a co-investigator on CIHR grants.